The pickle is a way of preparing certain foods in vinegar. With the vinegar’s addition the foods preserve for a longer time and they acquire a very different seasoning. The Mexican cuisine adopted this technique from the Spaniards and has expanded it along many ingredients but in this occasion we are going to focus in the baby corns . In this recipe the Mexican cuisine has been very cautious of not losing the baby corns’ soft flavor, when they are mixed with other ingredients. For this reason the baby corns are combined with ingredients that have soft flavors and as typical pickle is condimented with spices to obtain a very special flavor. The final result is a delicious accompaniment that can be used in almost any dish that has beef like an arrachera , a steak with onions or a cecina. Although they can also be used as snack and even as appetizer. This is a pickle that is moderately simple to prepare. 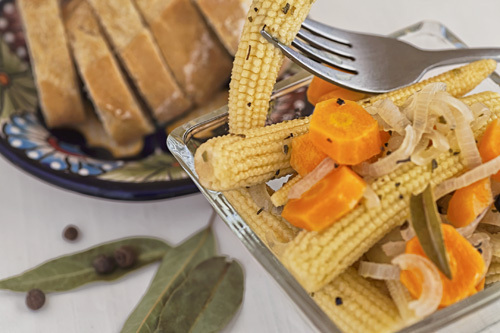 We give the recipe with raw baby corns but you can also use preserved baby corns. Use apple cider vinegar to make the recipe because it will give a subtle flavor to the pickle. The preparation time is of 20 minutes and then the pickle is left resting for 1 hour. If you are going to use preserved baby corns, don’t perform the first 4 steps. The enough Water to cover the baby corns. When it boils reduce to medium heat and leave the baby corns cooking for about 5 minutes, until they are soft. Remove from the saucepan, with a kitchen spoon, the baby corns that were cooked; then reserve. We recommend saving 1 cup of the Water (8.4 fl oz) that was used to cook the baby corns because it has more flavor and it will serve to cook the pickle. Cut 1/2 onion into half moons and reserve. Peel 1 carrot and then slice it, then set aside. Put in the saucepan the half moons of the onion that was cut and fry them for approximately 1 minute, until they look a bit transparent; stir regularly. Incorporate in the saucepan the carrot slices that were cut. Mix the ingredients and fry them for approximately 1 minute, until the carrot is lightly fried; stir regularly. The Baby Corns that were cooked. Mix the saucepan ingredients and fry them for about 5 minutes, until the baby corns are moderately fried; stir regularly. Mix the saucepan ingredients and bring the mixture to a boil over high heat. When the mixture boils turn off the heat, cover the saucepan and leave the baby corns resting for 1 hour, so the flavors settle and balance. Recommendation: You are also going to like a lot the white pickled. We recommend using these baby corns in the prepartion. With this allspice your pickle will have better flavor because it is organic. Put a lot of color to your table.